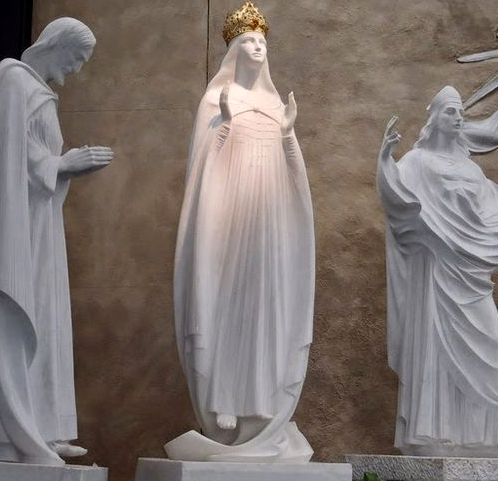 In these reflections on Our Lady of Knock (August 21, 1879), I have been presenting the symbolism of this silent apparition, and I have shown its connections to the other three recent apparitions of Our Lady: La Salette (1846 - here and here), Lourdes (1858) and Fatima (1917). They all point to a coming dire cosmic event, an approaching storm..
Today, I will briefly present two Marian devotions and their links to the Knock apparition. At Knock, Our Lady is described as wearing a white or silvery-white garment with a cloak clasped around the neck, a golden crown with a rose (Rosa Mystica) and topped with sparkling stars or crosses. She appeared outside the church on a slightly higher level than the other figures. But the most distinguishing feature of Our Lady in this apparition is her gaze and the position of her hands. 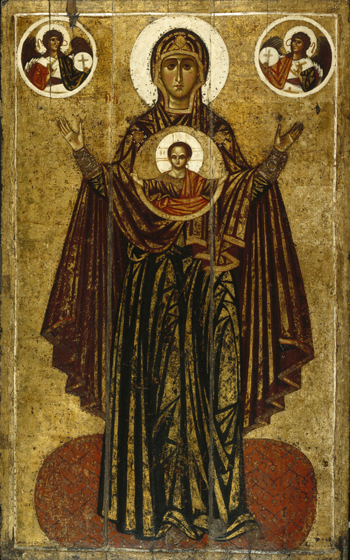 In fact, if you spot an image of Our Lady where she is gazing upward and her palms are raised to the level of her heart, a couple of feet apart yet facing one another, you are probably looking at an image of Our Lady of Knock. It is a position of someone who is directing an intense prayer to God. If we consider this apparition in light of the many chaotic, tragic and violent events of the last 137 years, the universal chastisement to come and her triumph foretold at Fatima, I believe we should see Our Lady’s posture at Knock as one of a mother who is praying, petitioning and interceding before God on behalf of her children, the faithful, concerning these coming events. I believe that Our Lady as “mediatrix of all graces” will someday be declared an infallible dogma of the Catholic Church. If this is true, then the apparition at Knock can be seen as a presage to the declaration of this dogma. It is rumored that Pope Pius XII was preparing such a declaration but changed directions and, instead, declared the less Protestant-offensive dogma of the Assumption in 1950. In this period leading up to the catastrophic Vatican II, the lax, liberal, and progressivist forces in the Vatican have been obstinately opposed to such an anti-ecumenical dogma that would declare Our Lady to be the universal mediatrix of graces. The 19th century was replete with miracles and manifestations of Mary, i.e. : The Miraculous Medal and her apparitions to St. Catherine Labouré (1830), Our Lady of the Miracle and her apparition to Alphonse Ratisbonne (1842), the finding of the 1712 manuscript True Devotion to Mary written by the Apostle of Mary St. Louis de Montfort (1842), Our Lady of La Salette (1846), Our Lady of Lourdes (1858), the declaration of the dogma of the Immaculate Conception (1854) and many other actions of Pius IX promoting Our Lady. 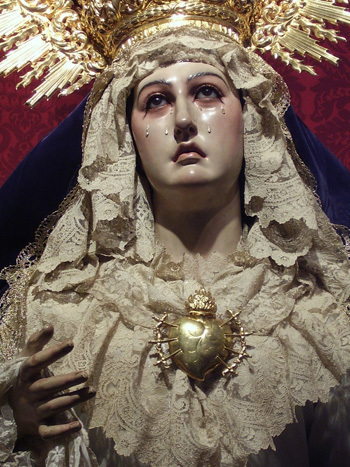 “In 1799 Pius VI, then in captivity at Florence, granted the Bishop of Palermo the feast of the Most Pure Heart of Mary for some of the churches in his Diocese. In 1805 Pius VII made a new concession, thanks to which the feast was soon widely observed. Such was the existing condition when a two-fold movement, started in Paris, gave fresh impetus to the devotion. "The two factors of this movement were, first of all, the revelation of the “miraculous medal” in 1830 and all the prodigies that followed and, then, the establishment at Notre-Dame-des Victoires of the Archconfraternity of the Immaculate Heart of Mary, Refuge of Sinners, which spread rapidly throughout the world and was the source of numberless graces. In 1944, when the Feast of the Immaculate Heart was finally proclaimed, the world was in the midst of the unprecedented destruction of the Second World War. Pius XII’s dedication of a feast day to the Immaculate Heart of Mary should be seen as a desperate plea and response to Our Lady’s request at Fatima,“God wishes to establish in the world devotion to My Immaculate Heart” (July 13th apparition). The new feast day would be celebrated on August 22. As a result, the day of the Apparition of Knock, August 21, which was already within the Octave of the Assumption, August 15, would mark the eve of the Feast of the Immaculate Heart of Mary. Just as the Knock apparition would be followed by the Fatima apparition, so also the feast day of Knock was followed by the feast day of the Immaculate Heart – which Our Lady at Fatima came to establish. Perhaps it could even be said that at Knock the opening of her hands that are normally folded in front of her Immaculate Heart was a pre-vision of this coming devotion and final triumph of her Immaculate Heart. It is important to note that all the seers at Knock viewed, to the right and in the background, a “plain altar with a lamb standing on it.” They further explained that what they meant by “plain altar" was, “an altar without candlesticks, linens or decorations of any kind.” It was an altar unadorned and bare. By 1969, in the aftermath of the disastrous Second Vatican Council, “Liturgical Reform” came as a destructive tidal wave. Pope Paul VI moved the Feast of the Immaculate Heart of Mary and changed or eliminated many other Feasts. Sacred, beautiful altars, like the liturgy, were stripped of beautiful ornaments, made plain, tossed out, desecrated and destroyed. 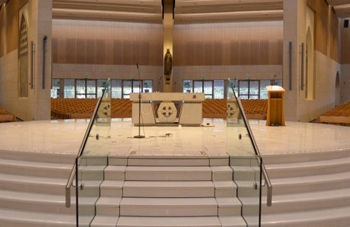 So, with this in mind, I believe that the presence of the “plain altar” in the Knock apparition was a prophetic allusion to this coming miserablist destruction of Vatican II. I pause here to present the words of Bridget Trench, who is considered one of the most interesting of the 15 Knock testimonies. “My name is Bridget Trench; I live near the Chapel at Knock. About half past seven o’clock on the night of the 21st of August, I was in the house of Mrs. Campbell, which was quite near to the Chapel. While I was there Mary Byrne came in and said there was a sight to be seen at the Chapel such as we never before beheld, and she told us all to come and see it. I asked her what it was, and she said that the Blessed Virgin, St. Joseph and St. John were to be seen there. "I went out immediately and went to the spot indicated. When I arrived there, I saw distinctly the three figures, I threw myself on my knees and exclaimed. “A hundred thousand thanks to God and to the glorious Virgin who has given us this manifestation.” I went in immediately to kiss, as I thought, the feet of the Blessed Virgin, but I felt nothing in the embrace but the wall, and I wondered why I could not feel with my hands the figures which I had so plainly and so distinctly seen. "The three figures appeared motionless, statue-like, they were standing by the gable of the Church in the background and seemed raised about two feet above the ground. The Blessed Virgin was in the center; she was clothed in white and covered with what appeared one white garment. Her hands were raised to the same position as that in which a priest holds his hands when praying at holy Mass. I remarked distinctly the lower portions of her feet, and kissed them three times. She had on her head something resembling a crown and her eyes turned up heavenwards. "I was so taken with the Blessed Virgin that I did not pay much attention to any other, yet I saw also the two other figures: St. Joseph standing to the right of the Blessed Virgin, or to the left as I looked at him, his head bent towards her and his hands joined; and the other figure, which I took to be St. John the Evangelist, was standing at her left. I heard those around me say that the image was St. John. "It was raining very heavily at the time, but no rain fell where the figures were. I felt the ground carefully with my hands and it was perfectly dry. The wind was blowing from the south, right against the gable of the Chapel, but no rain fell on that portion of the gable or Chapel in which the figures were. "There was no movement or active sign of life about the figures, and I could not say whether they were what living beings would in their place appear to be or not, but they appeared to me so full and so lifelike and so life-size that I could not understand why I could not feel them with my hands such as I beheld them with my eyes. "There was an extraordinary brightness about the whole gable of the chapel, and it was observed by several who were passing along the road at the time. I remained there altogether about an hour and when I came there first I thought I would never leave it. I would not have gone as soon as I did, but that I considered that the figures and the brightness would continue there always and that on coming back I would again behold them.